MANILA, Philippines - The Philippine Institute of Volcanology and Seismology (PHIVOLCS) reported a magnitude 6.0 earthquake that hit areas in Metro Manila and Luzon early on Sunday, January 11, 2015. Early report said that quake has a magnitude 5.7 but it's already corrected on its website and social media channels. The exact time of occurrence was recorded at 03:31:59 AM with epicenter 14.73°N, 119.76°E - 043 km S 55° W of San Antonio (Zambales). PHIVOLCS said that the earthquake that occurred has a tectonic origin, struck at a depth of 85 kilometers not 10km as reported earlier. PHIVOLCS also said that Intensity 4 was felt in the following Metro Manila areas: Pasig, Pasay, Manila, Quezon and Makati; San Mateo town in Rizal; and Obando and Hagonoy towns in Bulacan. Intensity 3 was felt in San Miguel town in Tarlac and Tagaytay City in Cavite. Intensity 2 was felt in Batangas City and Baguio City. 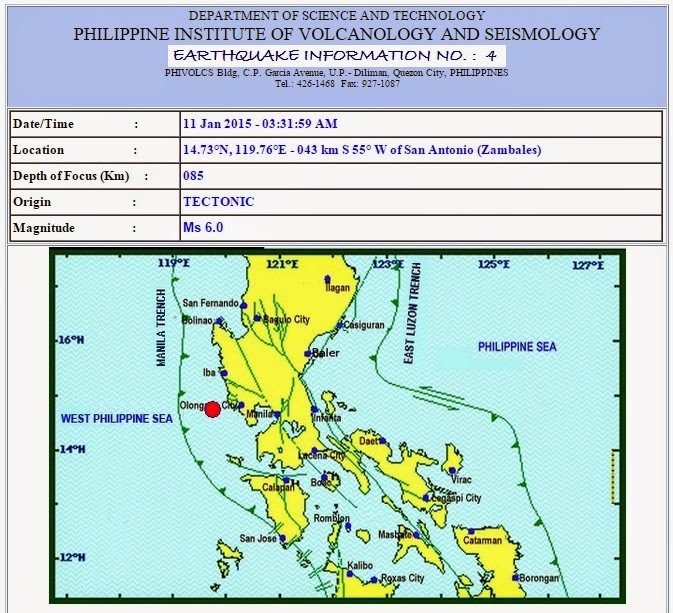 Phivolcs said the quake will not cause damage but is expected to produce aftershocks.